Clearing the Ground Inquiry | Transformational thoughts…. 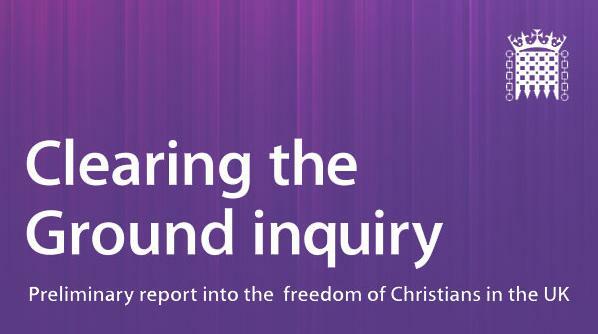 The preliminary report into the freedom of Christians in the UK from the Clearing the Ground inquiry has been launched today. The inquiry was overseen by Christians in Parliament, an official All-Party Parliamentary Group and the committee included MPs and Peers from the three major parties and from a range of Christian traditions. took oral evidence was submitted by over 40 key organisations, denominations, experts and individuals. • To clarify the situation that Christians in the UK face in their everyday lives. • To identify any particular challenges that Christians face, in particular identifying what aspects of legislation have created these challenges. • To identify what changes could be made to address these challenges. • To encourage Christians to continue to make positive contributions to all aspects of society. The report is extensive and is too long to do it justice in a one post review. The findings have been broken down into four key sections and I shall be reviewing key aspects of each section over the next few days. This report has been extremely well presented and if taken seriously by the Government has the potential to define how parliamentary legislation accommodates religious belief and could rewrite equalities laws to reduce religious discrimination. Please pray that this report is viewed favourably by those leading all the parliamentary parties. Christians in the UK face problems in living out their faith and these problems have been mostly caused and exacerbated by social, cultural and legal changes over the past decade. Christians in the UK are not persecuted. To suggest that they are is to minimise the suffering of Christians in many parts of the world who face repression, imprisonment and death if they worship, preach or convert. The recent wave of Christians in the courts does not in and of itself demonstrate that Christianity is badly treated. However, the frequency and nature of the cases indicates a narrowing of the space for the articulation, expression and demonstration of Christian belief. Some of the legal activity, associated campaigning and media coverage has been unwise and possibly counter-productive to the positive role that Christians play in society. There is a high level of religious illiteracy which has led to many situations where religious belief is misunderstood and subsequently restricted. This comes from a social and cultural minimisation of Christianity in public life. Religious illiteracy has led to legal restrictions on the way that faith can be expressed. Recent changes have compelled Christians to provide services that they had never previously offered and which may be contrary to their beliefs. It is evident that in some cases considerable effort is made to accommodate religious belief, with employers willing to make arrangements to ensure that employees do not have to participate in activities which would infringe their convictions. In many cases, there is a failure to achieve sufficient accommodation, and in some cases to even attempt to understand or accommodate belief and its manifestation. The experiences of Christians in the UK seeking to live out their beliefs and speak freely illustrate a very real problem in the way religious belief, and in particular Christianity is understood and handled. The problem is a pressing challenge to our idea of a plural society. The way that the media cover many of the cases and the associated issues is often poor and contributes to perceptions of a polarisation between Christianity and public life. The Equality Act 2010 fails to deal with the tensions between different strands of equality policy. Court decisions have relegated religious beliefs below other strands and effectively created a hierarchy of rights. The place of religious belief suffers because companies, institutions and the government do not take sufficient action to accommodate it. The 1986 Public Order Act, and specifically Section 5, places the bar too low through its prohibition on insulting language. The policing of the Public Order Act and other legislation demonstrates a lack of understanding of what is a legitimate expression of Christian belief. Government departments handle religious belief in a complex and confused manner and lack sufficient coordination. Advice from government departments on how to handle religious belief in the public sector varies and in many cases fails to grasp the nature and implications of belief. Guidance from professional bodies on religious belief often fails to understand, and therefore safeguard, a role for belief in public life. Across the UK, local authorities handle their relationships with religious groups in very different ways. Some authorities demonstrate excellent understanding and cooperation, while some authorities place unnecessary barriers to wider Christian contribution. These findings form the inquiry’s conclusion that there is a problem with how Christianity is understood and handled in Britain today. This problem is legal and cultural. It plays out on a national, local and personal level through laws, policies and regulations that restrict the freedom of Christians to articulate and live out their beliefs. There are specific and necessary steps which the government should take, and national and local bodies should implement to enable Christians and other faiths to have greater confidence in their freedom to express their beliefs. The committee heard from many witnesses supporting the introduction of statutory guidelines for reasonable accommodation. This would mean that employers and service providers have to make an effort to accommodate religious beliefs in a similar manner as they currently do with disabilities. This sort of approach acknowledges diversity and rather than promote a single universal resolution to a situation accepts that in different cases the response may, and often should, vary. Better guidance for government departments and professional bodies to help accommodate religious belief and the way it works itself out in everyday life. The problems that Christians face are far from universal, but they do represent a trend towards a reduction in the space given to belief in public life. As a result this leads to an assumption that religious belief should be a private activity. Christians in Parliament intends to use the findings and recommendations in this report as a basis for dialogue with other faith groups on the broader question of religion in public life. The report will also be discussed with the government, the Equality and Human Rights Commission and other groups to see how we can find a way to resolve these complex but important issues. Many of the challenges identified are not wholly the responsibility of the government to resolve. There is a growing need for churches and Christian organisations to take responsibility when their actions may have contributed to a perception that the scale of the problem facing Christians is greater than it is. Christians have, and will always, experience tensions between their beliefs and the shifting values of the societies that they live in. To some extent the present tensions should be seen as an encouragement of faithful witness. Ahead of bringing cases to court, Christians need to consider the potential impact their actions might have on politics, public opinion and the confidence of other Christians in their mission. The last century saw a privatisation of faith and the development of a sacred-secular divide through which Christianity lost much of its social and political influence. Now, too often the Church is defined by what it opposes rather than what it stands for. It is essential that Christians once again provide hope and a vision for society that goes beyond defending their own interests and includes the good of all. For many Christians public life is seen as a way of living out their beliefs, and across all denominations there is a growing awareness of the need to respond to the challenges that face our communities, nation and world. This shift is already transforming many, often deprived, parts of the country, however, there is much more that remains to be done in demonstrating this vital role of faith. Christians need to take seriously their historical role in leading and serving in public life, and church discipleship needs to account for this role – because the gospel is good news for society. This entry was posted in Christianity, Church, Culture, Discipleship, Dysfunctional, Institution, Integrity, Justice. Bookmark the permalink.